Where Can I Find Toaster Oven Pans and Bakeware with Lids? 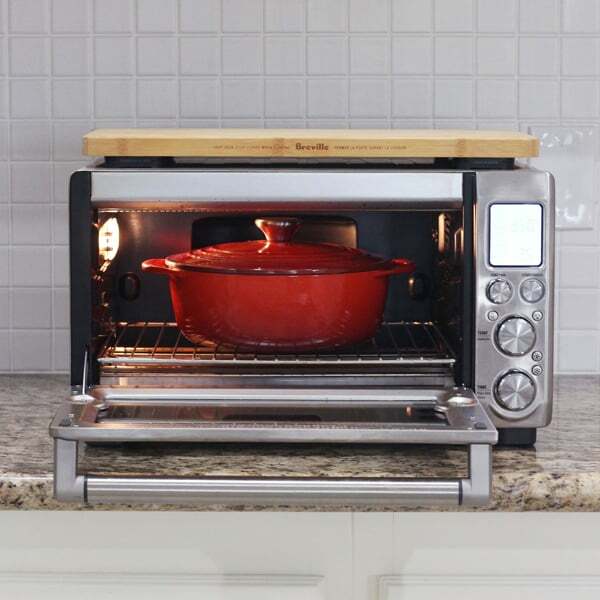 You are here: Home / "How To" Guides / Ask the Readers: Where can I find toaster oven bakeware with lids? You’d think that after years of shopping for mini pans and toaster oven baking dishes I’d have a bunch of great answers for that reader. The Truth: not so much. The problem is most major stores sell baking dishes and pans that use glass lids. Which means the product’s Use and Care guide will likely state, at a minimum, the lid is not for use in a toaster oven. That’s why I love the “use another pan to cover your dish” trick we shared in this toaster oven baking dishes post. But that’s more of a quick fix and not the ideal solution for everyone. So we’re turning to you guys for help! Right now, we own 2 pieces of cookware with lids that we use in our toaster oven. Below we’re sharing a little about each one and where they can be purchased. Then we’re asking you, our savvy toaster oven cooking community, to share about your covered baking dishes and where you shop for them. 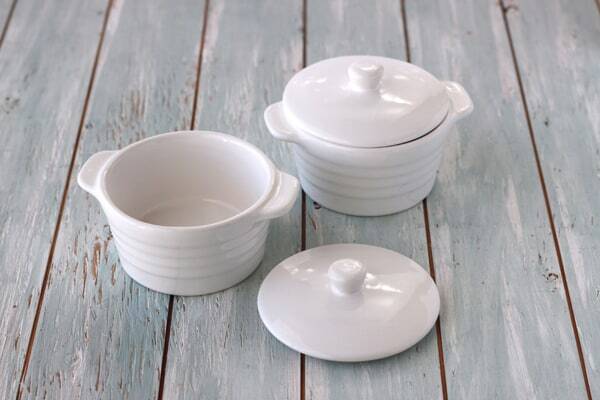 Last year, while shopping at Sur La Table I found these cute white stoneware mini cocottes. You can find them in a variety of fun colors like pink, navy, red, and yellow on Amazon too. 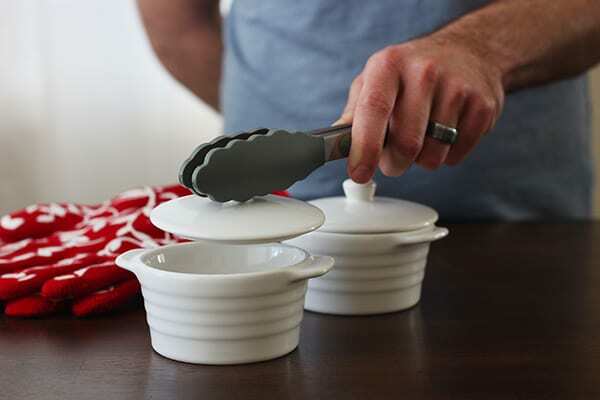 Each cocotte measures 4″ x 2.5″ and holds 8-ounces. Pros: They’re great for roasting a head of garlic in and if you remove the lids they double as ramekins for baking individual cakes and crisps. Cons: The knob handles on the lids are so small they’re nearly impossible to pick up when hot if you’re wearing oven mitts or gloves. Does your mini bakeware have these little doll-sized knobs too? Fun tip: use a pair of tongs to grip the knob and lift the lid. It works so much better than fumbling with a puffy oven mitt. 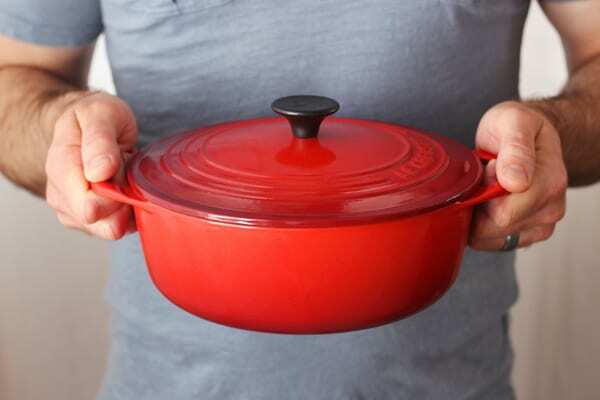 This 2.75 quart Le Creuset Shallow Dutch Oven measures 9″ diameter (11″ including handles) x 5″ tall with the lid. It’s available on Amazon in cherry red (my favorite!) and this equally eye-catching black oyster color (purchases through these links produce a commission for us). You can also find it at Sur La Table online and sometimes in the store. It’s not a piece they keep stocked in store year-round. I purchased ours there for around $130.00 during a killer holiday sale. Shopping Tip: The price fluctuates wildly at both stores. So if you want to purchase from either Sur La Table or Amazon wait for it to go on sale. Usually, if it’s on sale at one of them it’ll be the same (lower) price at the other store too. So when we first started looking for a dutch oven I wanted to find the largest one that would fit with the lid on inside our Breville Smart Oven Pro. A lot of great (and super affordable) options were either too tall or would require cooking without the knob on the lid. Unfortunately, Tim and I are C-L-U-M-S-Y in the kitchen. For our own safety, we NEED our hot lids to have knobs. Then last year, on our way to visit family in San Diego we happened upon a Le Creuset outlet store. Once we mentioned the Breville and that we wanted to cook with the lid on, the sales clerk showed us to the 2.75qt shallow dutch oven. 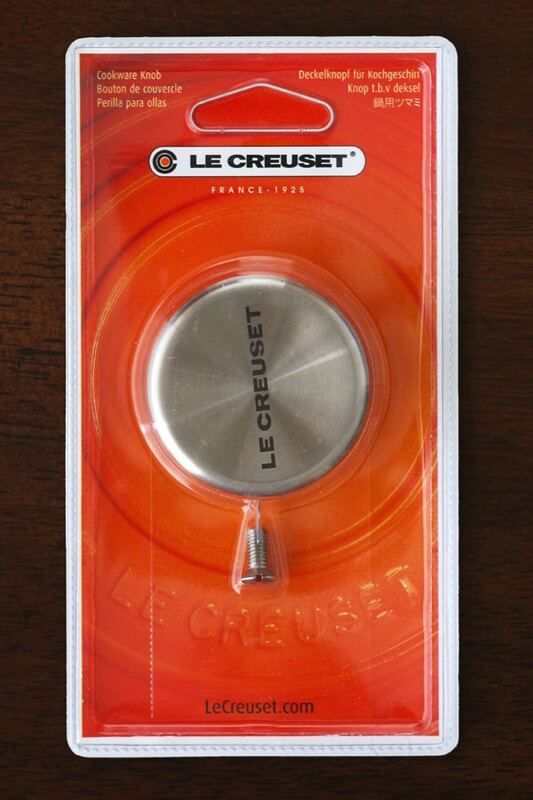 You can pick up the Stainless Steel Knob at most places that sell Le Creuset cookware. I got ours, a Medium Replacement Knob, from Amazon. It took about 60 seconds and a screwdriver to make the switch. Little tips like that are why I love shopping for toaster oven bakeware in smaller stores like Sur La Table and Williams Sonoma. I find the salespeople are knowledgeable about the products, enjoy cooking themselves and are usually pretty hip to the benefits of a #toasterovenlifestyle too! 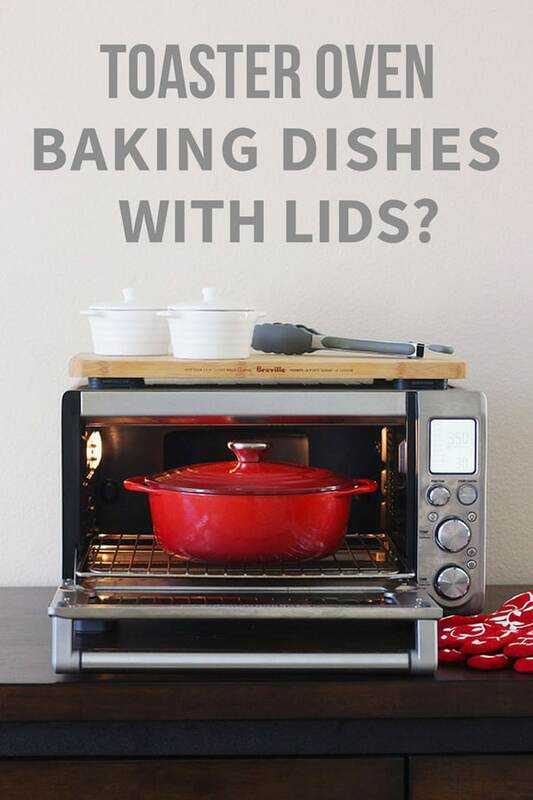 Do you have any favorite places to find toaster oven pans with lids? Leave a comment below! BASED UPON YOUR RECOMMENDATION. Sorry I did. This blog is only for larger ovens, NOT medium size or smaller. Don’t waste your time if you don’t have the same oven size as this bloggers. You’re on your own. I’m sorry you were confused, but we NEVER recommended that dutch oven for the Breville BOV650XL. The post clearly states we purchased it for our Breville Smart Oven Pro and even includes a photo of it inside of our Smart Oven Pro. Hi. I know this is an older article, but I hope someone sees my comment. Yesterday I bought the shallow dutch oven at the Le Creuset Outlet in Carlsbad, CA. It was on sale for $99. The color choices were cerise and oyster. I surprised myself by opting for Oyster and buying the large stainless steel knob. It’s a beautiful piece of cookware. It does indeed fit nicely in my Breville Smart Oven. I saved $150, and I am thrilled! Well done, that’s a fantastic price, Kristy! I was kicking myself for not purchasing ours when we were at the outlet – you can’t beat their prices and the quality is 100%. Congrats on your steal, the Oyster is sooo pretty and classy I bet it looks great in your kitchen. Also, thanks for leaving a comment and letting other’s know, I’m sure many will find it helpful! Nice for mac & cheese or (my favorite) braised chicken thigh w/ sauce and veggies of various kinds. They’re cast aluminum, non-stick, really nicely made. I can fit both in my Cuisinart Toaster Oven at the same time. I love this Portmeirion line (I own several open baking dishes that I use often in my toaster oven). It’s high-grade porcelain so it can be used in the microwave as well. This piece with the lid is about 6″ high. 3) Another Sophie Conran piece — technically a butter dish, but the size is PERFECT for a toaster oven baking dish. It’s the same high-quality porcelain, so it works fine. It’s about 5″ x 6″ and about 3.5″ high with lid. Lana, those are ALL such great suggestions! Thank you for sharing your picks and for taking the time to gather the links too! Believe it or not but I find quite useful cooking contraptions at second hand stores. I would certainly love to be able to shell out 130.00 bucks for cast iron but those who can’t get imaginative. Checking thrift stores is a great idea, Lisa! Ours are awesome for clothing but unfortunately slim pickings in the housewares department. I’d love to hear more about the different second hand dishes you’ve been able to find that work for your toaster oven. One of my favorite bloggers, The Frugal Girl recently wrote a fantastic post on the pitfalls of judging how others choose to spend (or not spend) their money: http://www.thefrugalgirl.com/2018/01/we-are-all-making-choices-with-our-money/ I found it very insightful. Sorry, I cannot find any mid-size pots with lids either. I am looking for one that is in-between your size and the small ones. I found a great place to purchase a lot of my small utensils and I plan to ask them about the pot with a lid. It won’t help you much as it is my local grocery store. If they find them I will send you the brand name. However, I wouldn’t hold my breath. LOL I think we have both looked to hard for them! Lol, you are right, that mid-sized dish has been alluding us both for far too long! But it sounds like you have an awesome local grocery store so who knows maybe they’ll come up with a genius find. If they do I’d LOVE to get the brand name.